The expansive front porch of the Los Saguaros Carnegie Model is a inviting area to meet friends and family. It provides a comfortable area to welcome guests into your brand new home. As people enter, they can easily see through to the covered patio to the stunning desert views. Moving through the foyer, guests will be struck by the spacious dining room adjacent to an impressive kitchen. 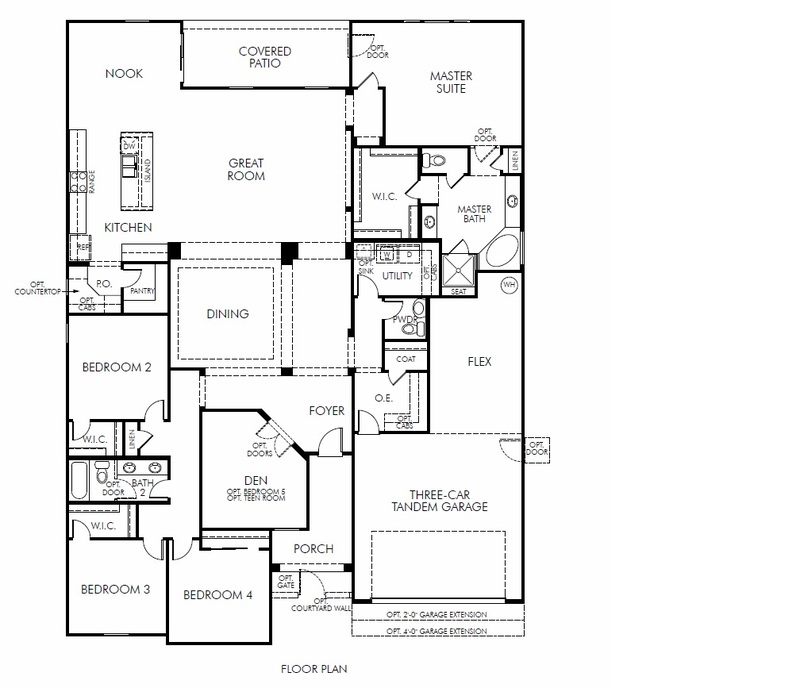 The master suite of the Los Saguaros Carnegie Model has a large walk in closet. The master bath has a garden tub with a separate shower. The Los Sauaros Carnegie Model has three additional bedrooms, den, and an optional flex space which could be a workout room, hobby room, teen room, or even a 5th bedroom. The Los Saguaros Carnegie Model Floor plan has a variety of options for room layouts and space usage. There are 3 elevations for the Los Saguaros Carnegie Model. Los Saguaros at Dove Mountain homes are all contemporary or Mediterranean in style. Meritage Homes is creating Los Saguaros at Dove Mountain with ENERGY STAR CERTIFIED homes using current energy saving technology and construction methods. Nearby subdivisions include Dos Lagos, Solana at Dove Mountain and the Highlands at Dove Mountain. Los Saguaros at Dove Mountain homes are served by the Marana School District. This community also offers an array of amenities nearby hat include: Golf Courses, Parks, Spa and fitness facilities, Hiking Trails and of course views. Moving to the Tucson, Arizona area or considering Tucson for a future place to call home? Tucson has many things to do all year around, including golf, Pickleball, hiking and more. We are a top Realtor team in Tucson, AZ. Read our client testimonials. Give us a call. We can help you find that perfect home in Tucson AZ. We are the professionals in Tucson real estate.